There is increasing awareness of the importance of urban green spaces for biodiversity conservation, human well-being, and delivery of ecosystem services. In this presentation I will give an overview of two lines of my work. The first analyses the effects of urbanization-driven fragmentation on remnant plant and fauna communities. For this purpose, I will focus on the Western Australian Banksia woodlands, a species-rich plant community and habitat threatened by ongoing urban development. The second takes a broader view to green infrastructure and addresses the key question: how can we improve urban green spaces in order to maximize the delivery of benefits for people and other species? 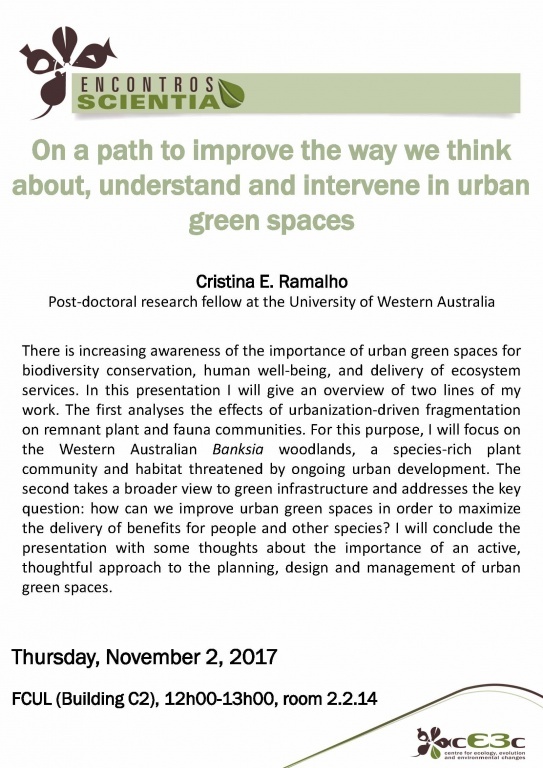 I will conclude the presentation with some thoughts about the importance of an active, thoughtful approach to the planning, design and management of urban green spaces.